If you are on a limited budget, but you still want to have a furry friend, it’s possible if you plan ahead and make smart choices. Owning a pet can be costly, but it’s entirely doable to be a frugal pet owner. It’s also important to be a responsible pet owner no matter how large or small your budget is. You can keep your four legged friend happy and healthy without spending too much money. 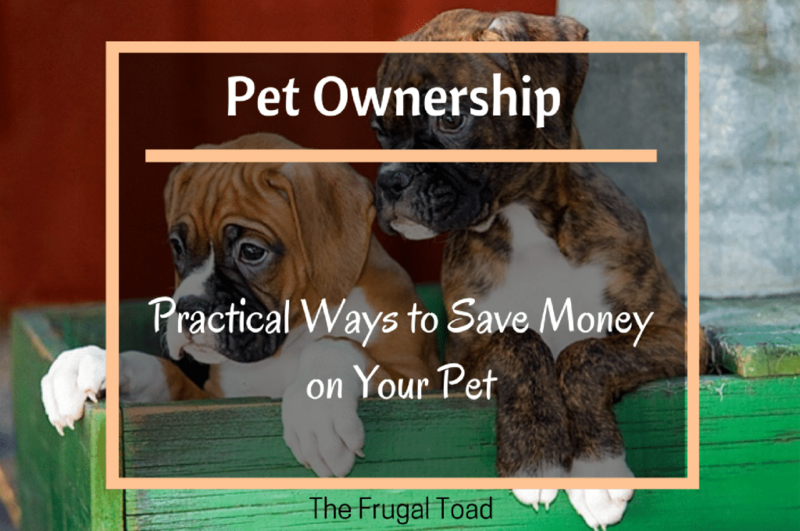 Here are some simple ways to stay frugal with pets. To start with, you should only adopt a pet from an animal shelter or rescue organization. While most of these places won’t offer you a pet for free, they can help you get your new best friend for very little money. If you choose to go to a breeder and purchase a dog or a cat, you could expect to pay thousands of dollars. It’s much better to save this money and help give an animal a new lease on life. The age of your pet can influence how much money you end up spending on his essentials. While many potential pet owners want a baby puppy or kitten, this can be more expensive. Puppies and kittens require a larger investment up front with initial vaccination costs, frequent examinations, and the cost of neutering or spaying. An older animal may have more medical expenses as well. A better idea is to consider adopting a younger animal who has passed the puppy or kitten stage. Your pet’s vet care costs can add up, especially that first year. Not all veterinary offices are created equal, and you may get more value from a lower priced vet. Many vet offices offer special package pricing for examinations and frequent visits if your pet has medical problems. Some local animal organizations may offer free or discount medical services if your income is a certain level. You can also get discount vet prescription pricing if you check with your local pharmacy. Keeping your pet healthy starts with establishing some regular healthy habits that should last throughout your pet’s life. A high-quality pet food may be a reasonable thing to consider investing a little more money in if it helps keep your pet’s vet bill lower. Be sure to give your pet plenty of exercise and keep up with the regular vet checks so problems can be dealt with before they get too serious. This way, you and your pet can look forward to sharing many years together. The cost of your insurance policies, such as your homeowners insurance, may also be impacted by your pet. Many insurance companies now address certain dog breeds and may increase your rates. Breeds such as pit bulls or Rottweilers may be part of your insurance company’s dangerous breed list. Be sure your furry friend won’t make your rates rise. Talk to your insurance agent to get more information about what you should do to ensure your rates stay competitive. The last thing you can do as a frugal pet owner is look for free and low-cost activities that both you and your furry friend can enjoy together. Many regions around the country have dog parks that offer pups space to run and socialize with other friendly canines. If you’re near the coast, you may even find some pet-friendly dog beaches. Meet new people and get together for free with your local pet club to find out more. If you’ve always dreamed of owning a pet but your budget is a little short, you can still find a way to make it work. Take some time to do your research before committing to your new furry friend to benefit from some of these recommendations. Tips all prospective owners should follow … great post!